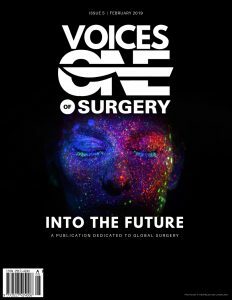 Voices of One Surgery is a free, periodical, not-for-profit magazine dedicated to global surgery and is part of the One Surgery project. One Surgery is run by a growing international team passionate about surgery and improving standards of care worldwide. After successfully producing our first four issues, we call for articles for our fifth issue, titled “Into the Future”. In this issue, we aim to discuss the future of global surgery, with particular reference to the use of technology and training to improve the outcomes of surgery across the globe. Voices of One.Surgery aims to unite and promote the advocacy efforts for global surgery by providing a platform for sharing ideas, projects and stories. Through a combination of story-telling, interviews and web technology, we aim to address the plight of unequal access to surgical care. If you are passionate about the global surgery movement, have unique stories, projects or ideas to share with the world, please send a full article to voices@one.surgery no later than the 14th January, 2019 23:59 GMT. We aim to represent as many voices as possible from all over the world. Medical and allied health students, anaesthetists, surgeons, physicians, nurses, global surgery advocates, public health professionals, patients or anyone with an interest, passion or experience in global surgery are all welcome to submit articles. WHAT SHOULD BE SUBMITTED FOR THIS ISSUE? Commentaries, op-eds, infographics or photo essays focusing on the theme issue “Into the future – technology and training”. 1. Clearly defined brief title. 2. Up to 1000 word body text. 3. Profile picture, brief resume and email address of the author. 4. Clear, high-resolution photographs supporting the article. 5. Our style aims to be easy reading that is inviting to the general public as well as engaging to healthcare professionals. 6. Avoidance of controversy including discussing any political topics that may cause unrest, or any offensive, negative material. 7. Permission from relevant stakeholders involved in the article should be obtained. Your submission or proposal will be reviewed by the editorial team. If accepted, an in-house editing process will take place and the article will be carefully drafted. The draft will be then returned back to the author to ensure approval for publication. Authors will have full freedom to withdraw consent during this preparation time. Once the publication is formally published, the magazine will be distributed under a creative commons licence and free to share for non-commercial use. Once published, we may not be able to retract it from the world wide web. All authors will receive a certificate of appreciation from One.Surgery for their published article.